May 23, 1541: Francisco Vásquez de Coronado and the Teya Indians have a feast in Palo Duro Canyon in Texas to celebrate his expedition's discovery of food supplies. Many people consider this to be the first true North American Thanksgiving. Sept. 8, 1565: Pedro Menéndez de Avilés lands in St. Augustine and he and his men share a feast with the natives. 1578: The first North American celebration of European harvest festivals is held in Newfoundland by the Frobisher Expedition. Dec. 4, 1619: 38 colonists from Berkeley Parish in England land in Virginia and give thanks to God. Dec. 11, 1620: The Pilgrims land at Plymouth Rock. Their first winter in the New World is hard and their number of 102 is reduced to 56. Fall 1621: The Pilgrims hold a three-day feast to celebrate their first bountiful harvest. They include 91 Indians in the festivities to thank them for helping them with the harvest. This is often cited as the first Thanksgiving. 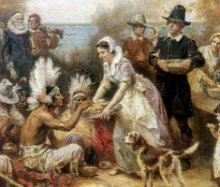 1623: After a severe drought ends in heavy rainshowers, the Pilgrims invite the Indians for another feast to give thanks for the welcome rain. June 20, 1676: The governing council of Charlestown, Massachusettes holds a meeting to decide how to express thanks for their good fortune. They proclaim June 29th as a day of thanksgiving. June 29, 1676: The scheduled day of thanksgiving is celebrated. Oct. 1777: All 13 colonies participate in the thanksgiving celebration. 1789: After members of Congress request it, George Washington declares that a national day of thanksgiving will be held on November 26th. Nov. 26, 1789: On the day of thanksgiving, George Washington writes in his diary: "Being the day appointed for a thanksgiving I went to St. Pauls Chapel though it was most inclement and stormy - but few people at Church." Dec. 24, 1814: The Treaty of Ghent is signed by British and American emissaries, ending the War of 1812. April 31, 1815: At the end of the War of 1812, President James Madison declares a national day of prayer and thanksgiving. 1827: Sarah Hale, editor of Boston's Ladies' Magazine, writes essays calling for an annual national celebration of Thanksgiving. Nov. 1846: Sarah Hale, now the editor of Godey's Lady's Book, begins a letter-writing campaign to have the last Thursday in November named national Thanksgiving Day. Dec. 26, 1850: The Territory of Minnesota celebrates its first Thanksgiving. Sept. 28, 1863: During the Civil War, Sarah Hale sends a letter to President Abraham Lincoln asking him to proclaim a national Thanksgiving Day. She has been trying for almost 17 years to have it proclaimed a national holiday. Oct. 3, 1863: In the midst of the Civil War, President Lincoln proclaims a national Thanksgiving Day on the last Thursday in November. The proclamation reads, in part: "I do therefore invite my fellow citizens in every part of the United States, and also those who are at sea and those who are sojourning in foreign lands, to set apart and observe the last Thursday of November next, as a day of Thanksgiving and Praise to our beneficent Father who dwelleth in the Heavens. And I recommend to them that while offering up the ascriptions justly due to Him for such singular deliverances and blessings, they do also, with humble penitence for our national perverseness and disobedience, commend to his tender care all those who have become widows, orphans, mourners or sufferers in the lamentable civil strife in which we are unavoidably engaged, and fervently implore the interposition of the Almighty Hand to heal the wounds of the nation and to restore it as soon as may be consistent with the Divine purposes to the full enjoyment of peace, harmony, tranquillity and Union." 1920: Gimbel Brothers Department Store sponsors the first Thanksgiving parade in the streets of Philadelphia. Thanksgiving Day, 1924: The first annual Macy's Thanksgiving Day Parade is held in New York City. 1927: Tony Sarg creates the first giant balloons for the Macy's Thanksgiving Day Parade. Thanksgiving Day, 1934: The Detroit Lions play against the Chicago Bears. This is the first year the National Football League holds a game on Thanksgiving Day. It is broadcast on the radio and becomes a national tradition. Aug. 1939: President Franklin Delano Roosevelt declares the second-to-last Thursday in November to be Thanksgiving Day instead of the last Thursday in the month. This is done to benefit retailers by extending the Christmas shopping season by one week as the holiday season officially starts the day after Thanksgiving. Nov. 1939: Confusion sets in throughout the country, with people unsure whether to celebrate Thanksgiving on the 23rd or the 30th. 1941: President Roosevelt signs legislation to reestablish Thanksgiving on the fourth Thursday of November, but it doesn't take effect until 1942. Thanksgiving Eve, 1947: President Truman pardons a turkey that is marked for Thanksgiving dinner in the White House. This becomes an annual White House tradition. Thanksgiving Day, 1956: The first television broadcast of the Thanksgiving Day football game. Thanksgiving Day, 1963: President Lyndon Johnson addresses the nation just six days after the assassination of President John F. Kennedy. He says he is "determined that from this midnight of tragedy we shall move toward a new American greatness." Thanksgiving Day, 1970: Dressed in traditional Native American clothing, 25 Native Americans hold a day of mourning in Plymouth, Massachusetts.